Mesa, Arizona, located in the southern part of the state known as the Valley of the Sun, is America’s largest suburb and the third largest city in Arizona after Phoenix and Tucson. Home to the Fresh Foodie Trail, a route that features a dozen food-driven experiences (many of them multi-generational family-owned and operated), Mesa and its surrounding area is a beautiful place to visit. In the Mesa region you can find the Sonoran Desert, historic Apache Trail, Usery Mountain Park, spring training (baseball!) and the prickly pear cactus! The city, which sees over 300 days of sunshine a year, also has great museums, local shops, restaurants, and more! A lot of snowbirds actually come to Mesa (and area) each year, including many from Alberta! It is a wonderful place to escape too-cold winter weather. Mike and I were fortunate enough to partner with Flair Airlines and Visit Mesa for a sponsored media tourism weekend in early February and had such an amazing experience. With cheap and direct flights through Flair, it’s really easy to visit Mesa and explore so many things it has to offer. 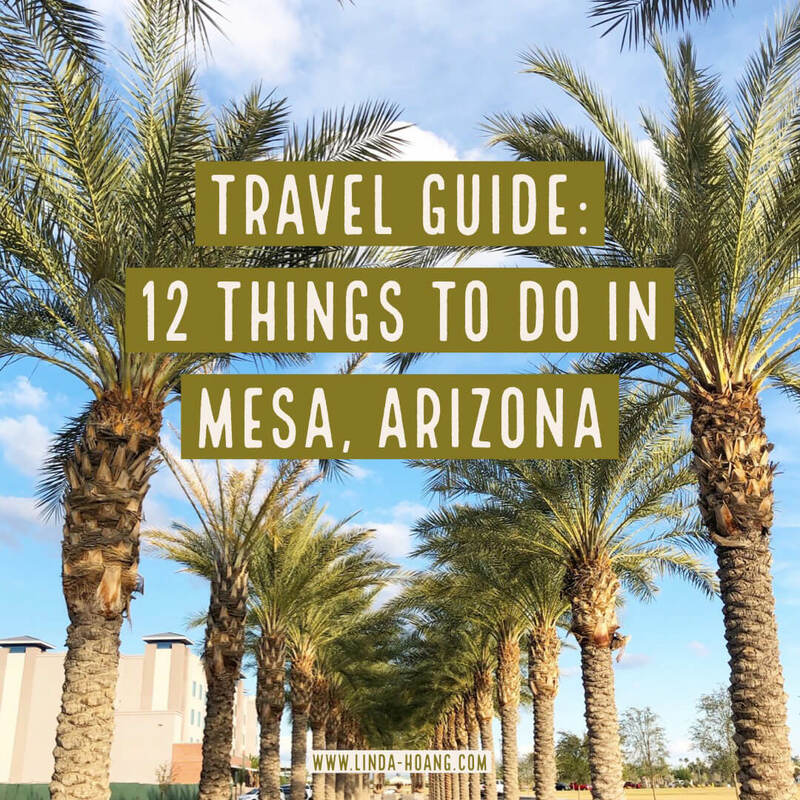 I’m so excited to share travel tips and inspiration for you below as you plan your visit to Mesa, Arizona! 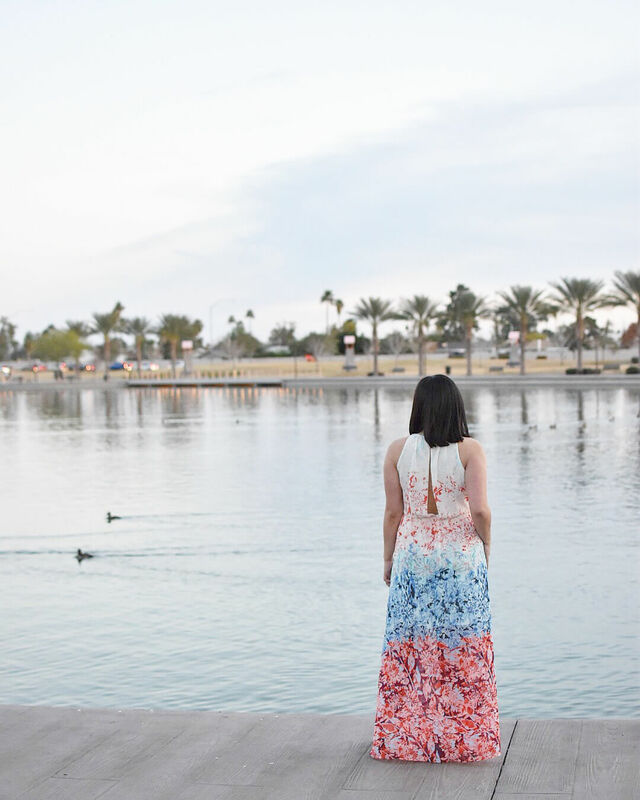 Pin + share my blog post Travel Guide: 12 Things To Do in Mesa, Arizona. Picking oranges at Agritopia along the Fresh Foodie Trail! There are so many amazing family farms in Mesa! The area has a booming agitourism industry. Something popular with both locals and tourists is exploring the Mesa (and area) Fresh Foodie Trail! On this trail there are a dozen food-driven experiences you can try. The trail will take you to many multi-generational family farms and businesses, offering tours and some of the freshest food you can find, all home-grown in Arizona. As they like to say, Mesa “had a Food Network before there was a Food Network!” (So clever). On our tour, we visited spots like The Orange Patch, Queen Creek Olive Mill, Schnepf Farms, and Agritopia. 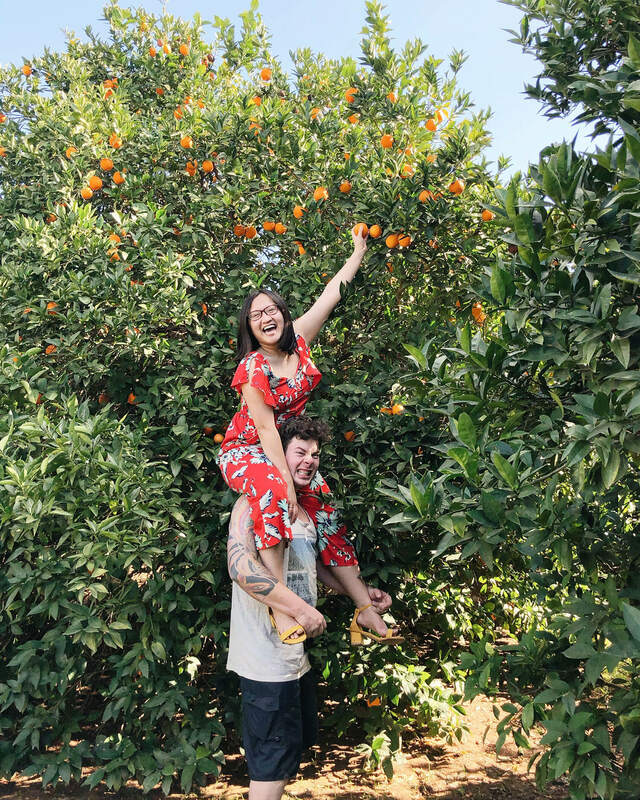 Such a diverse set of spots, we did an olive oil tour, learned about an entire community centred around an urban farm, took in a farm dinner and learned about citrus season. I had so many people recommend a place called Jalapeño Bucks to me, it wasn’t on our tour but is a really popular spot on the Fresh Foodie Trail you’ve got to visit yourself! 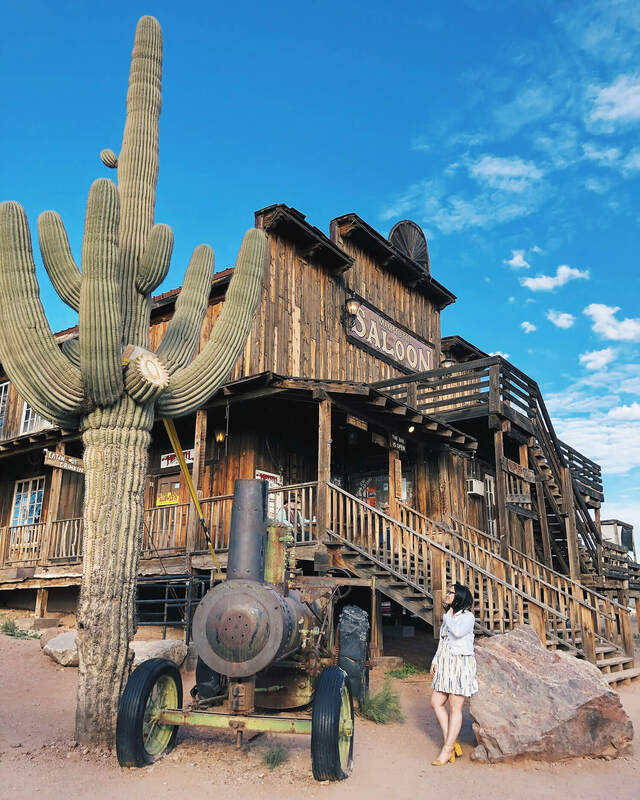 It’s like being transported back to the wild wild west at the Goldfield Ghost Town. Cruise Canyon Lake on The Dolly Steamboat! While you’re in the area, considering hopping on a boat at Canyon Lake. You might be thinking Arizona… desert… lake? And scratch your head a bit, but there’s actually a few different bodies of water in the Mesa area and Canyon Lake is popular one because its home to the Dolly Steamboat. 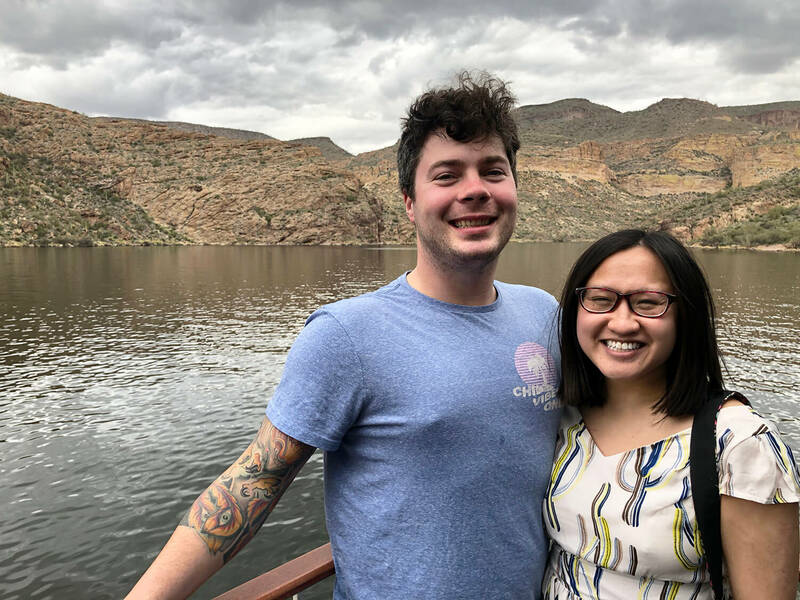 We took the Scenic Nature Cruise on The Dolly Steamboat, a 90 minute, 6-mile cruise all over the lake where you’ll learn some different facts about the area and potentially spot desert bighorn sheep, bald eagles and more! Near Canyon Lake is a place called Tortilla Flat, another old-timey, wild west strip of stores and restaurants. I had awesome chili at the restaurant and, speaking of the restaurant, there’s dollar bills pinned all over the interior of the restaurant, along with the skin of a giant snake. There was also live music next door when we stopped by. It was a really fun place to visit! 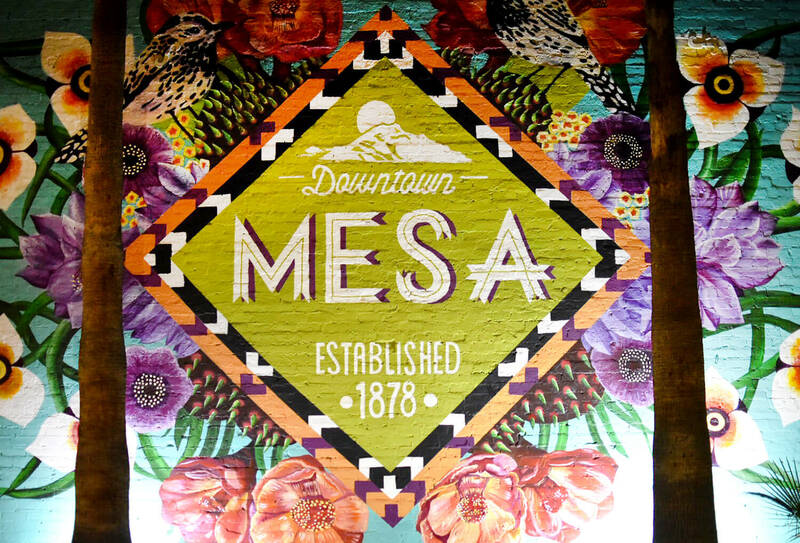 There’s lots of great murals in Downtown Mesa! As I do wherever I travel, some of the free time we had on our tourism trip was spent searching out some Instagrammable Walls! Downtown Mesa in particular has a bunch of lovely murals and brightly coloured areas that are worth photographing. We also found some Instagrammable Walls over in neighbouring Gilbert. Although Phoenix wasn’t part of our itinerary (but we definitely want to explore Phoenix too! ), I’m told that there are a ton of wonderful walls in Phoenix as well. One thing I thought was interesting about Mesa murals was that they have lights to illuminate parts of the murals at night. I thought that was a nice touch! While you’re photographing yourself at Instagrammable Walls of Downtown Mesa, you should also check out their cute shops! The Downtown Mesa strip is home to a lot of different shops, restaurants and museums. There’s cute coffee shops, vintage/thrift stores and home decor/furniture places. There’s also a really interesting thing called Dinosaur Trackways all along downtown. These are dinosaur footprints all along the sidewalks which are meant to show the path of actual dinosaurs which once walked the area over 200 million years ago. Really neat! Goat Yoga was one of the most memorable experiences of our Mesa, Arizona trip! 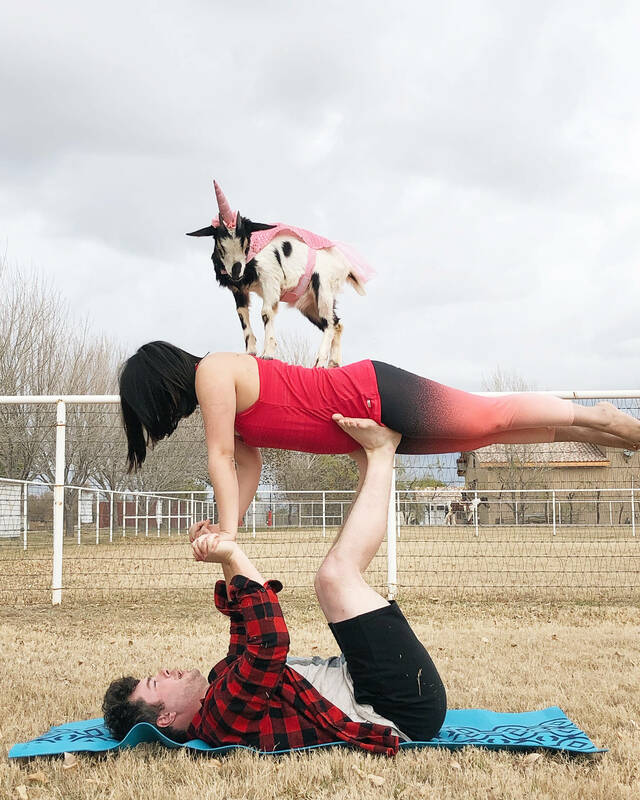 Something you may not realize about Arizona (in particular, Mesa) is that it is home to some pretty popular Goat Yoga! Goat Yoga Arizona began in February 2015 and is run by April Gould and Sarah Williams. April is a goat farmer and “Goat Whisperer.” Sarah has been a yoga instructor for over 20 years. April had goats. Sarah taught yoga. So they decided to combine the two and now offer the biggest and most popular Goat Yoga class in Arizona. We took part in a $15 Goat Yoga class and had unbelievable amounts of fun. The goats come dressed up (ugh! So cute!) and you are allowed to pick them up and hold them (more cuteness!) They also jump on your back as you’re doing different yoga poses. It was probably the most memorable experience from our entire trip. Such fun! Gorgeous mountain + desert views along the Apache Trail. The winding roads of the Apache Trail in the Superstition Mountain Range are a bit dizzying (be warned!) but breathtaking. There’s lots to do along the way (see some of my previously suggested ideas), but just the drive and history itself is worth a visit of its own. The trail features miles of scenic desert, wilderness and mountains. There are 2,000-feet high mountain cliffs that hide the ‘Lost Dutchman Mine’ which was fascinating to learn about. 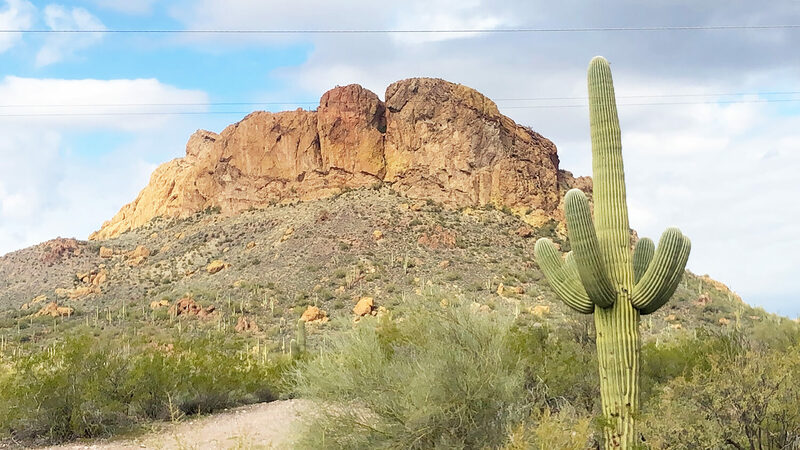 According to legend, it’s a gold mine hidden in the Superstition Mountains that has never been uncovered. Each year, people search for the mine (and in past years, some have died on their search). The mine is named after a man called Jacob Waltz who apparently discovered the mine but kept its location a secret. People have been trying to locate his rich gold mine since 1892! We didn’t go looking for the Lost Dutchman Mine but we thought the lore (and the views along the trail) was pretty cool. On one of our evenings we dined in the Neon Sign District of Gilbert. That’s not actually what it’s called (though it would be neat if they branded it that way) lol but there’s a few blocks along Gilbert Road downtown where many of the restaurants have neon signs! 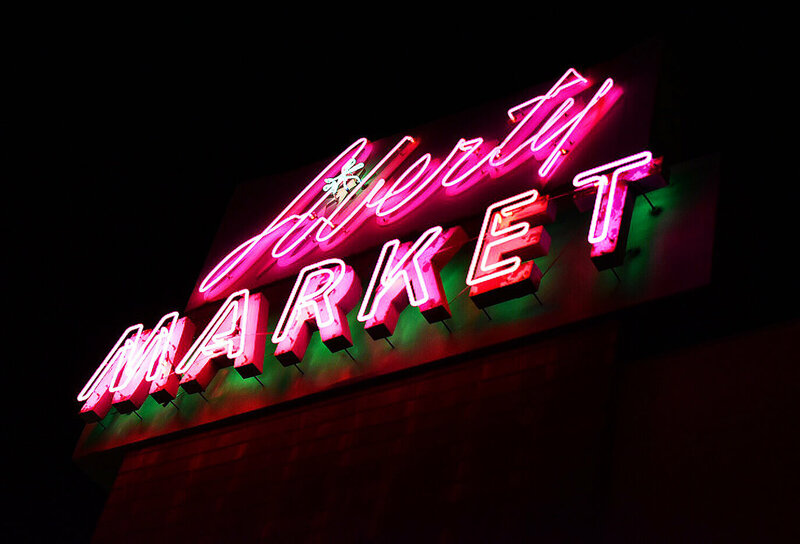 From Liberty Market to Oregano’s Pizza Bistro, Heritage Marketplace to Petersen’s Ice Cream, a Friday night on the streets of downtown Gilbert was really lively and a lot of fun. Many of the restaurants along this road had patios that opened out onto the streets. We had some amazing bruschetta (so many different toppings!) at Postino. The whole area had just a really great atmosphere and was a place we definitely wanted to return to. Glamping at the Cozy Peach at Schnepf Farms was a wonderful experience! Glamping, also known as glamour camping, is becoming increasingly popular as more people want to experience the outdoors but with a little bit of Wi-Fi and a comfortable bed. That’s reasonable isn’t it? As part of our trip, we spent a night glamping at The Cozy Peach Glamp Grounds at Schnepf Farms. Schnepf Farms is an amazing agri-tourist spot home to a U-Pick, bakery, amusement park, peach trees, petting zoo, walking trails, gardens, a ton of different festivals RV camping and a glamping site. 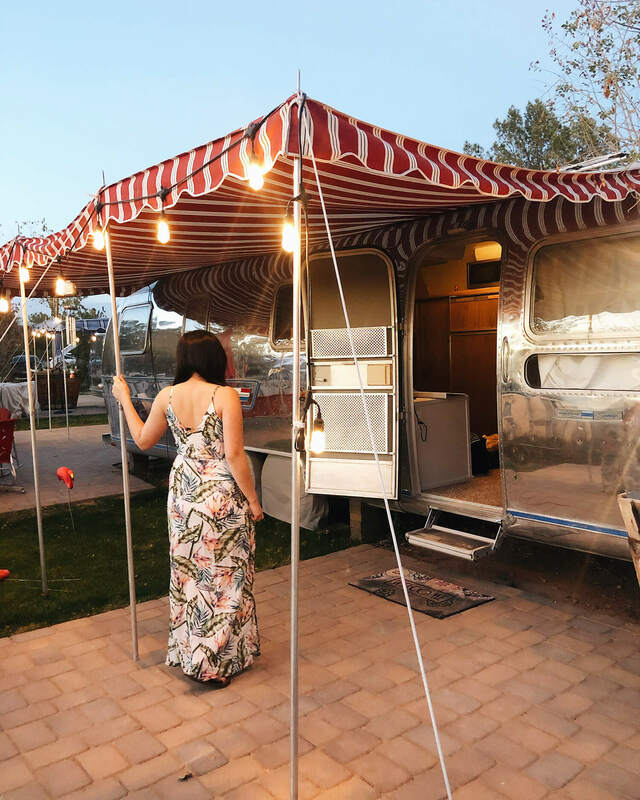 The glamping accommodations are all vintage Airstream trailers with the cutest colourful awning and string lights. The bed is unbelievably comfortable. There’s a microwave, sink, TV (with Netflix! lol), and Wi-Fi. Owners tried to keep these restored Airstreams as original as possible. You can add breakfast service to your trailer door, or do a farm dinner add-on to your stay. In the morning, you can hop on provided bicycles to go and explore the huge grounds (we visited a secret library!) Glamping at The Cozy Peach at Schnepf Farms was such a highlight for our trip. The Schnepf family are so sweet. We couldn’t recommend staying here enough! The Mesa Farmers Market at Pioneer Park is a lovely way to spend a Saturday morning! 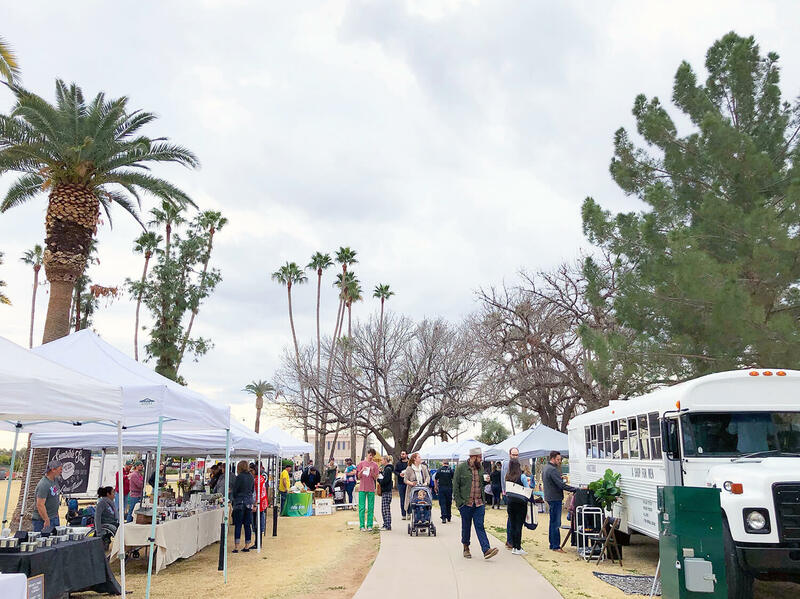 On Saturday morning head over to Pioneer Park and explore the Mesa Farmers’ Market! The market is new(ish) as of February 2019, and when we went there were close to 20 vendors, but the goal is bring that up to 70+ vendors plus 8 food trucks. It’s a year-round market on a park site that has beautiful palm trees, a big playground, basketball courts and a historic steam locomotive. I bought the cutest little prickly pear wooden magnet from a local maker / vendor Citizen Home Decor. There’s some vendors selling clothes and jewelry out of old buses (so neat!) and we had a really delicious breakfast at Morning Kick. Mike marvelling at the blue prints for the original electric standing kitchen mixer at Agritopia’s Barnone. This ties into the Fresh Foodie Trail but I wanted it to have its own stand-alone point. 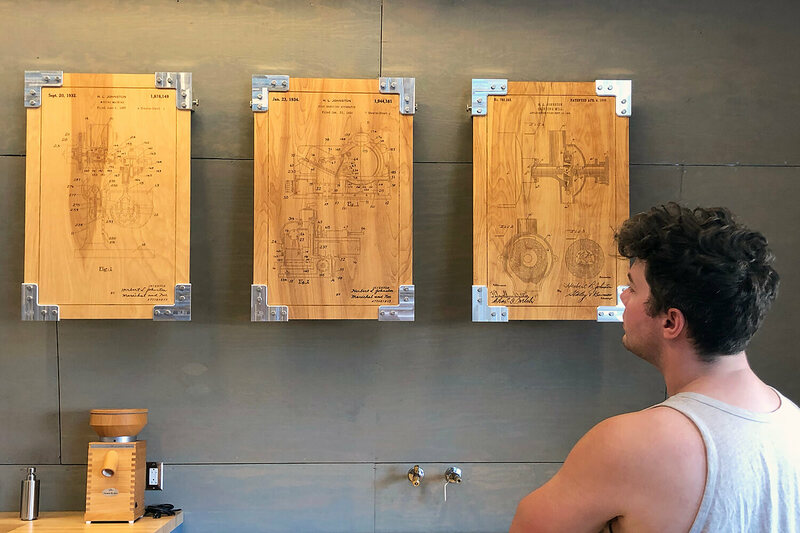 At Agritopia, the community I mentioned which is centred around an urban farm, inside a building called Barnone, you’ll find Johnston Machine Co., a little workshop that features a bunch of blueprints showing kitchen mixers. On our visit, it took me a moment to realize that the person giving us a tour, one of Agritopia’s owners William Johnston, is the great great grandson of Herbert Johnston, the inventor of the electric standing KITCHEN MIXER. Oh my. I was so excited. Seriously. I was SO excited. But the entire Barnone space is really cool, featuring a bunch of local crafters, makers, builders and their shops. Mesa Riverview Park is gorgeous! The last thing I recommend you do when in Mesa (for now, just wait until my next trip and I come up with 12 more things for you to do! ;)) is walk around the gorgeous Mesa Riverview Park. The park features a gorgeous lake (Lake Ramada) where you can actually go fishing in. There is also palm tree-lined boardwalk, nearby playgrounds, and just down the road is sloan Park, home to spring training of the Chicago Cubs. I loved walking along the boardwalk (it’s gorgeous during the day but also lit up nicely at night). We also saw a bunch of people ‘bird’ around the boardwalk as well. Bird is a new brand of electric scooters that are apparently very popular in Arizona. We walked along the park two nights in a row and saw a ton of people scooting/birding (whatever you want to call it lol) around. They looked like a ton of fun! So there you have it, 12 ideas to get you exploring all that Mesa, Arizona has to offer! I felt like Mike and I got to do a ton on our tourism trip, yet—still not enough (story of our traveling lives). There’s so much more I want to do in Mesa, Gilbert, and Phoenix and I’m thrilled that Flair Air offers cheap and direct flights down. As I mentioned, a lot of people from Alberta head down to Arizona each year and if we’re being honest, Mike and I had always wondered what the appeal was (other than the nice weather). Now after having been, we get it! Arizona is a beautiful place and where we were—was so full of activity, adventure, and culture. 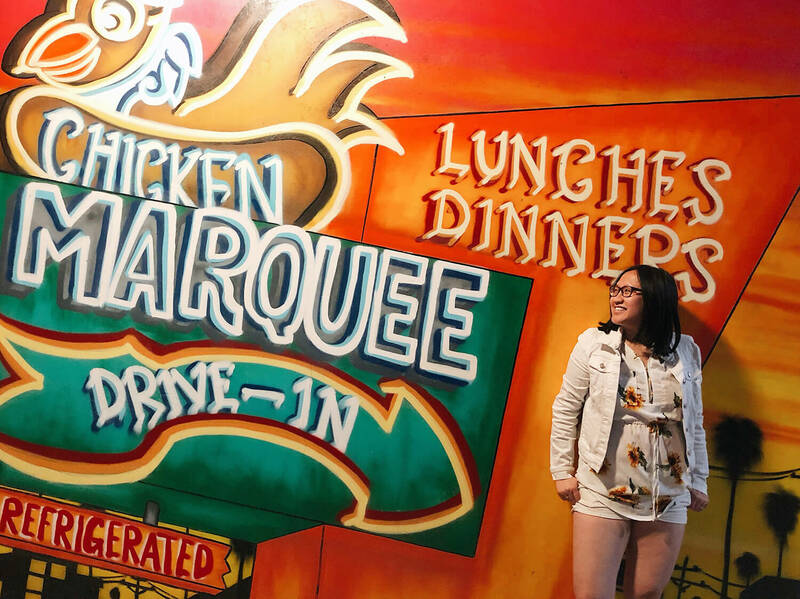 I need to come back for more of a food-focused trip alone, but am so thrilled we got to experience so much of Mesa and I hope my ideas for things to do help as you plan your trip. If you’re interested in seeing more photos, check out my Mesa, Arizona Instagram Story Highlight and see some of my tweets from the trip!